One of the most commonly used words so far on this trip has been ‘project’. 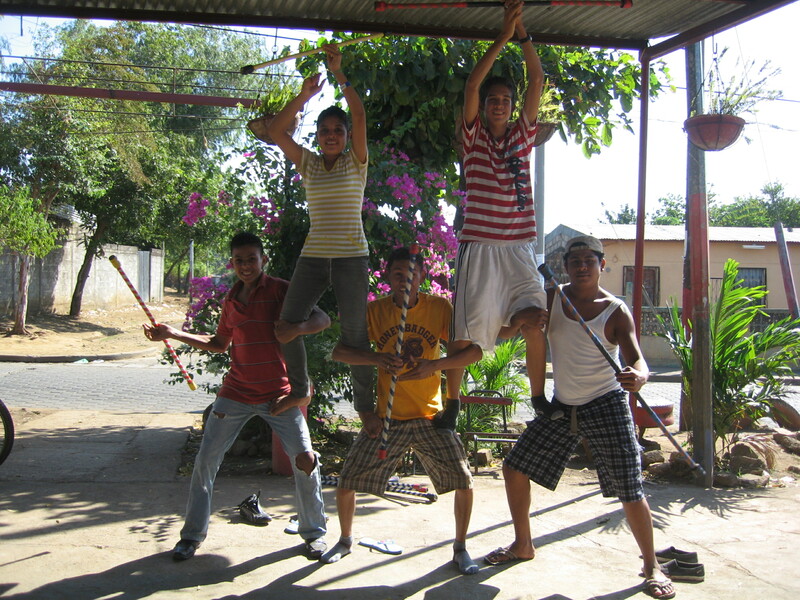 We are on the ‘PWB Nicaragua 2013 Project’, which involves working on three projects in three towns/cities, each project is based at already established projects, and within each project we have many opportunities to do outreach work at many other projects. You get the picture. As most of our time and energy is spent focussing on the place where we work continuously for 4 weeks, it is quite refreshing and exciting to venture out to other groups of children around the city (Léon) to share our skills with them. 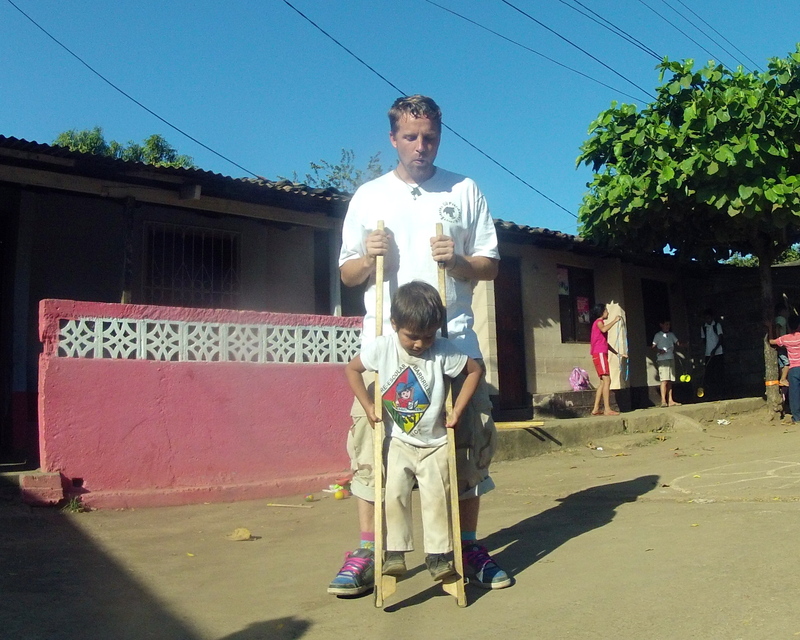 In our daily routine of traveling to El Barrilete to work with our regular group of children, we have (or at least try to have) a certain amount of structure and various systems in place to make an attempt at getting the best results possible. And this is what I mean when I say it is “refreshing” to do outreach work. Workshop-wise it is a chance to have a bit more freedom with the way we teach; an opportunity to maybe try out new stuff or teach a skill we don’t get a chance to within our daily teaching regime. 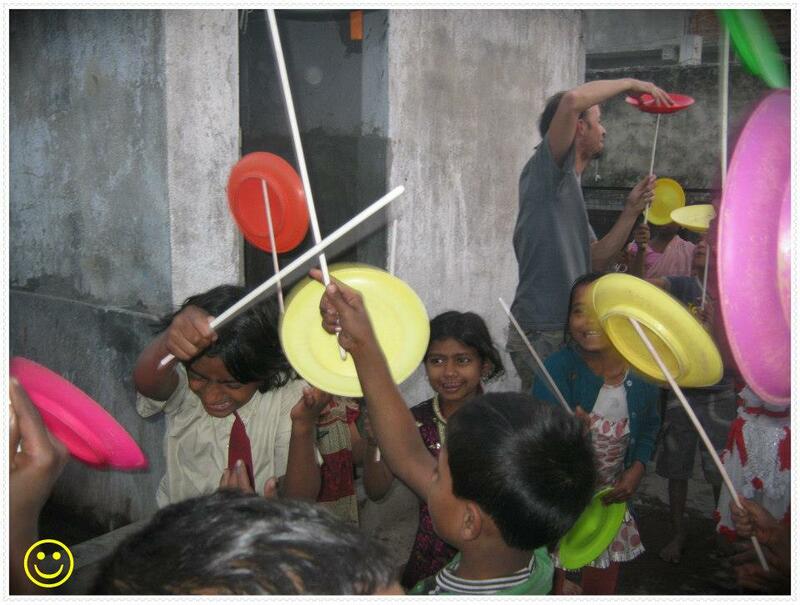 Sometimes we might just play for an hour with the children having a go at juggling, hoop, staff, songs, and silliness. But sometimes it can take you by surprise, as yesterday did. We (Bags, Emily, and I) visited a centre for ‘niños desfavorecidos’, called Las Chaviladas, where we were greeted excitedly by a group of boys aged between 8 and 13, who were desperate to show off their already fairly competent juggling and diabolo skills. Many of them could juggle 3 balls and most of them could confidently throw and catch a diabolo. It might not sound like much but it was fantastic to see such rapid progression in our hour session with them, which was possibly down to the amount of practice they had had at the basics, without the opportunity to have any tricks taught to them before. Part of me feels a bit sad that we don’t get to spend more time with more children (one month with one group, when there are so many) but obviously it is important to have a significant amount of time with some to be able to leave them with something that will last. And this is an important part of PWB; the legacy. Which is another wonderful thing about the outreach work. At first glance it can seem that this extra work is just a fleeting moment of excitement for the children involved but our experience at Las Chaviladas shows anything but. They already had a small amount of equipment (homemade juggling balls and some broken diabolos) and some basic skills. So off the back of that, this ‘fleeting moment of excitement’ has brought them far more. A few more tricks is one thing but there are two others that are far more important and, to me, demonstrate what a big part of PWB is about. One is that the children were clearly hugely inspired and this is something that can last for a very long time. And the other is the connection between Las Chaviladas and PWB. We came to Léon to work at El Barrilete and we knew nothing about any of the other groups we have seen. Now there is a connection with so many more children and if PWB is ever in Léon again, places like Las Chaviladas will definitely get return visits, hopefully with more organisation and more time. So I feel like I should come to some sort of conclusion at the end of these ramblings, but I can’t. All I will say is that I am pleased to have written about all of this without using the word ‘project’. Last year and the year before and the year before that, I watched the videos of the PWB India team and felt the familiar pangs of ‘ahhhhhh I really want to do a PWB project’!!!!! But I knew that I had to wait until the time was right for me and to see if I would be accepted. Another of my dreams was to live in a Spanish speaking country for about 3 months. You can imagine how excited I was to have been chosen for the PWB Nicaragua team fulfilling two life ambitions in one trip! 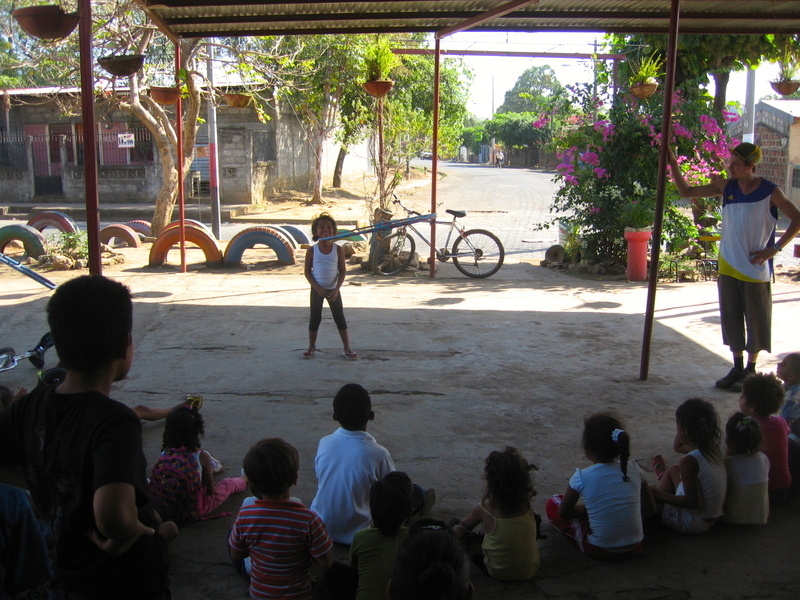 We have now been in Leon for three weeks and have been teaching at El Barrilete. It is great to see the kids now honing their attention in to their favorite circus toys and improving their skills in these specialized props. 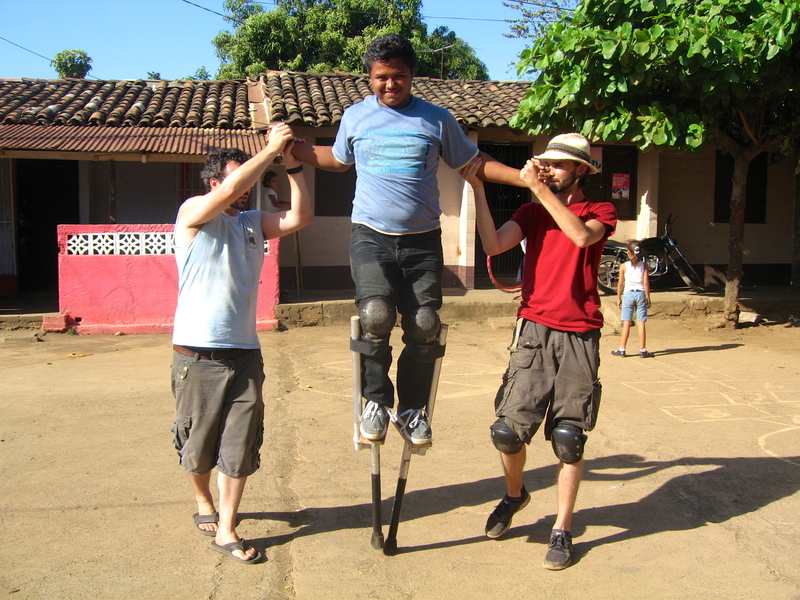 In the first two weeks every child at the project had the opportunity to play with hula hoops, staffs, poi, juggling, music, acro-balance, diabolo, stilts and unicycling. These were taught in small age specific sessions with an ‘open box’ session at the end of the day involving some ‘unstructured learning time’ as they say (‘they’ in this case is Bags and Emily). This week has been a different experience for the children as they have had the opportunity to choose two props and delve deeper into learning and playing. We finish the workshop with the open box sessions so that each child can play with any prop every day. 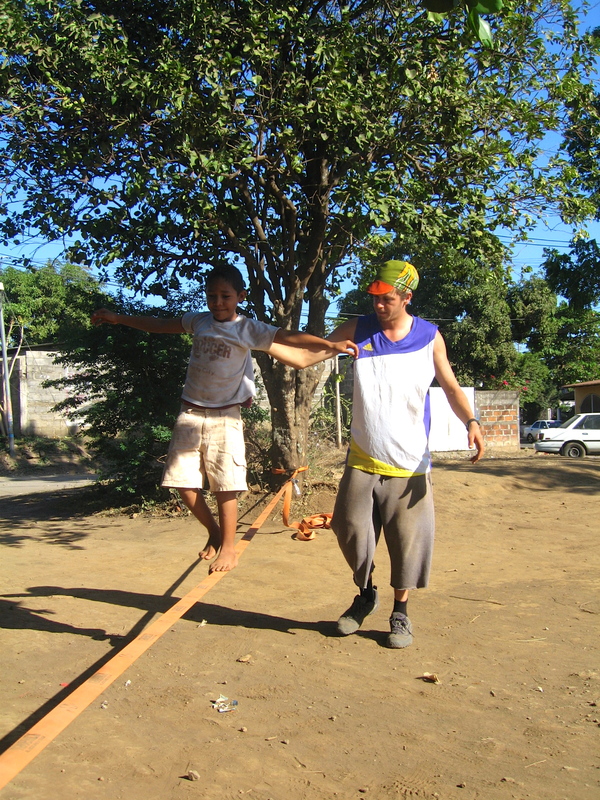 The most popular sessions from this project appear to be acro-balance, hula hoop and diabolo. I have been lucky enough to teach my favorite prop this week which is of course…that amazing plastic circle – you know, for kids! 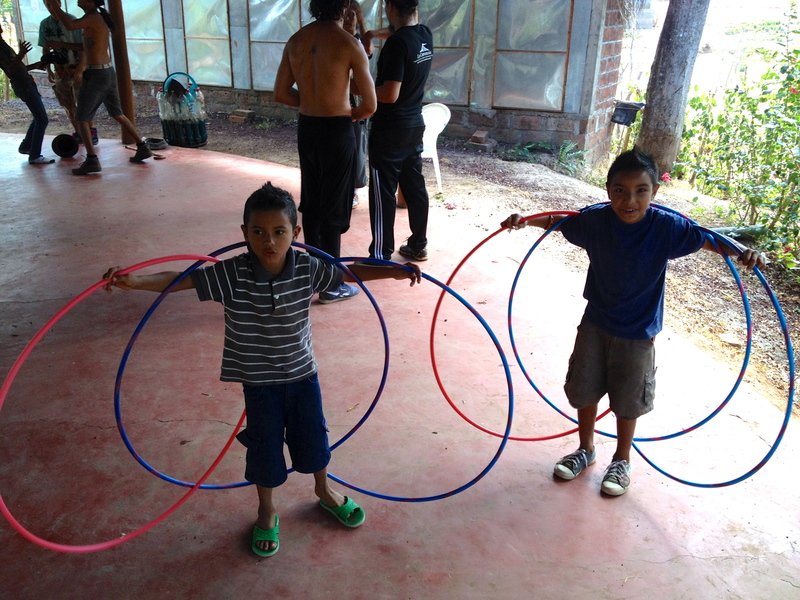 As well as teaching more moves with one and two hoops, we have also worked on a few partner and group moves that we may perform in the kids show which is to be performed at the end of our time in Leon. As this is our third week here, it is noticeable how our rapport has developed with the children at El Barrilete signified by the various hand shakes and verbal greetings when we arrive and depart from the workshops. My favorite, inspired by Tom, is ‘hasta banana!’ – are we teaching the kids bad English or good Spanglish? We have been networking here in Leon, exploring which children’s projects exist and if we can do outreach in the form of shows and/or workshops. Last week we performed our show at the first day back at school for the ‘Escuela Especial’ – a school for children with various disabilities. After the show we watched the students take turns to bash open a bunny rabbit pinata – bashing open paper mache characters and then getting high on sugar is a pretty regular occurrence over here! We had our own turn at this on Emily’s birthday – take that Mini Mouse! 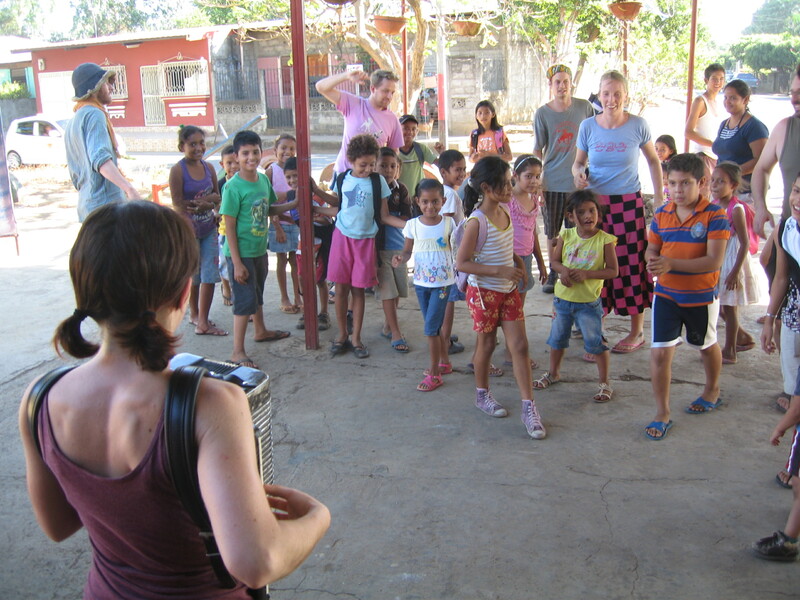 Later on in the week we performed a more improvised Cabaret show at ‘Ninos del Fortin’ – a project that supports disadvantaged children, most of the children are from families who earn money via collecting rubbish. These children are given the opportunity for further support at the project especially focusing on education. The Cabaret show was a success with many giggles and laughs from the children and a worthwhile experience of performing in the midday sun on a scorching hot floor – certainly added a level of urgency to my hopping hoop routine! 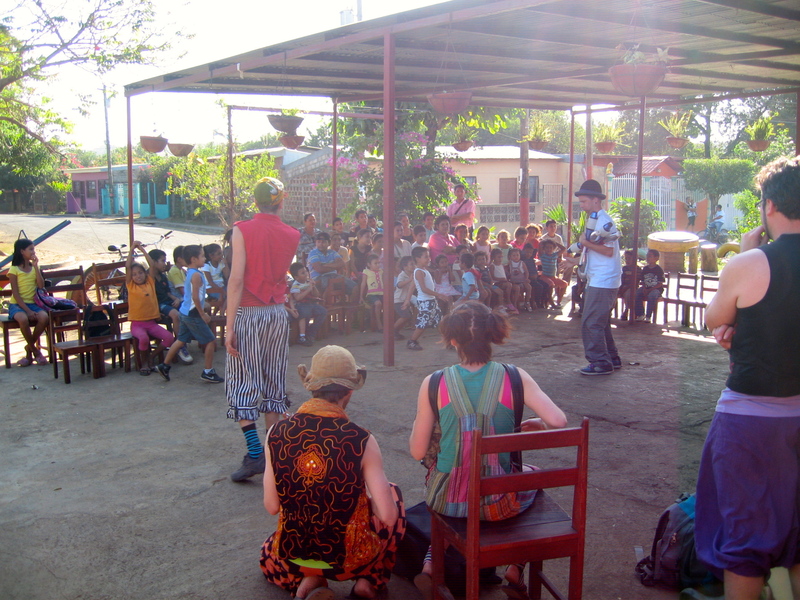 This week we will be returning to Ninos Del Fortin to do some workshops with the children. At the weekend we performed two more shows; one was a Cabaret show at ‘Aldeas Infantilas SOS’ – Children’s Villages SOS, an international organisation which helps families to care for their children and provides quality care for children who cannot live with their biological families. The team enjoyed the added improvisational and clowning element of the Cabaret show including dealing with problems on stage like low ceilings and kids running on stage repeatedly. On Sunday we performed our show in the main square in Leon. This was an opportunity to get PWB out to the people of Leon and show them a bit of what we do – although we are already getting noticed as we rehearse, practice, play and train in the local parks, not to mention walking around town with a stack of hula hoops or on the unicycle! 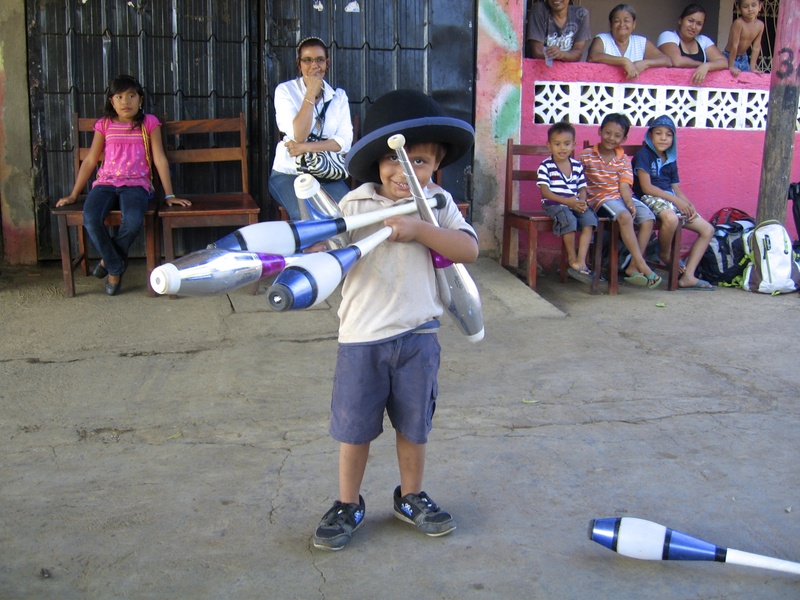 This week we have more shows and workshops with other various children’s project in Leon. I feel it is good to be making contact with so many children through outreach, performance and play whist delving into more skills with the children at El Barrilete. On a more personal note I am finding teaching a great learning experience. By this I mean the challenges that come with teaching in Spanish and teaching children who often want to learn but want to play more. It is very important for us to be flexible and to use the energy of the children to their advantage as opposed to being rigid and disappointed not to teach what we have planned for them. One of my personal goals was to use and improve my average to ok Spanish – this is of course being challenged every day in the teaching and whenever I find anyone Spanish speaking to have a chat with! I found a family of fishermen at the beach recently and ended up staying in my hammock in their ‘front porch’ on the beach, which was a fantastic opportunity to understand Nicaraguan culture, food, language and family relations. They whole family lives together, the grandparents, the mother, father and three children. At night they were relaxing together on their ‘porch’, chilling out in hammocks, chatting and joking. The youngest child was rocked to sleep in a hammock with the father, a really relaxing and beautiful sight. I practiced my Spanish with the family, my handstands withe the oldest child and my throwing and innovative game making with the youngest two! They were a kind family who fried me a fish from the next mornings catch! All seafood is hereby ruined for me as that was the freshest fish I shall ever eat! On other levels of personal development I am learning to ride a unicycle (and am developing muscles in strange places due to this), i have finally, after 8 years of not trying particularly hard, learnt to JUGGLE (balls and rings!!) 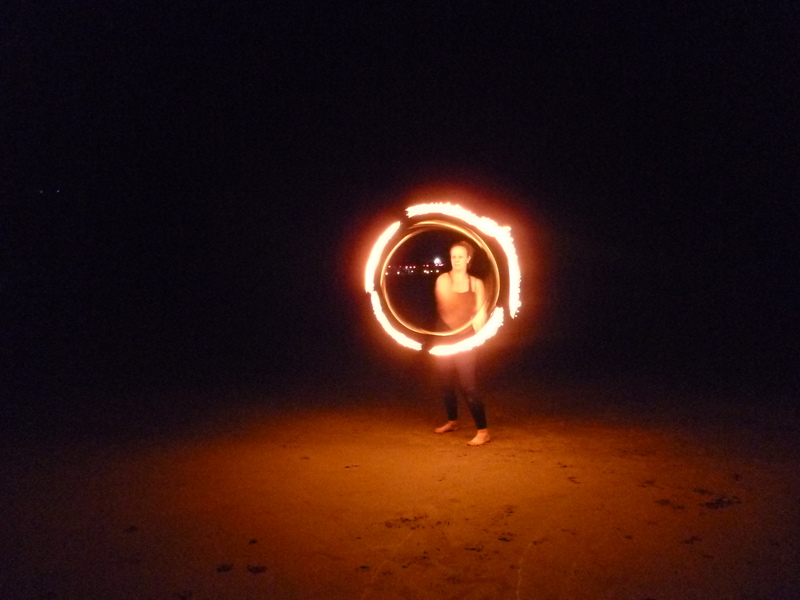 and I am really enjoying having time and space to practice and improve my hoop, (90’s) poi, double staff and handstands. Come on 5 hoop split!! 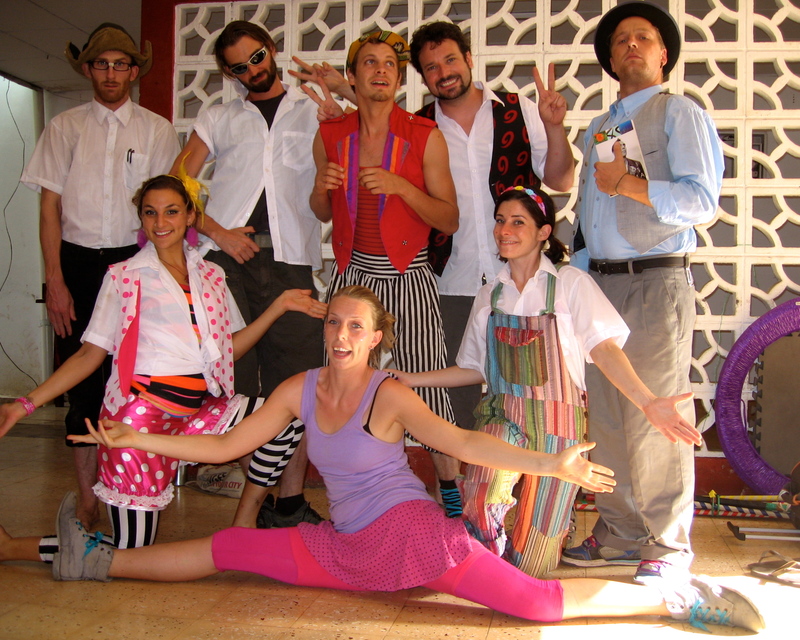 I am constantly feeling appreciation for the fact that I am here, finally, in Nicaragua, on a Performers Without Borders project and I feel lucky to be in the position to be able to teach kids circus and other performance skills and to perform shows with this colorful bunch of ………….. (insert appropriate word here). 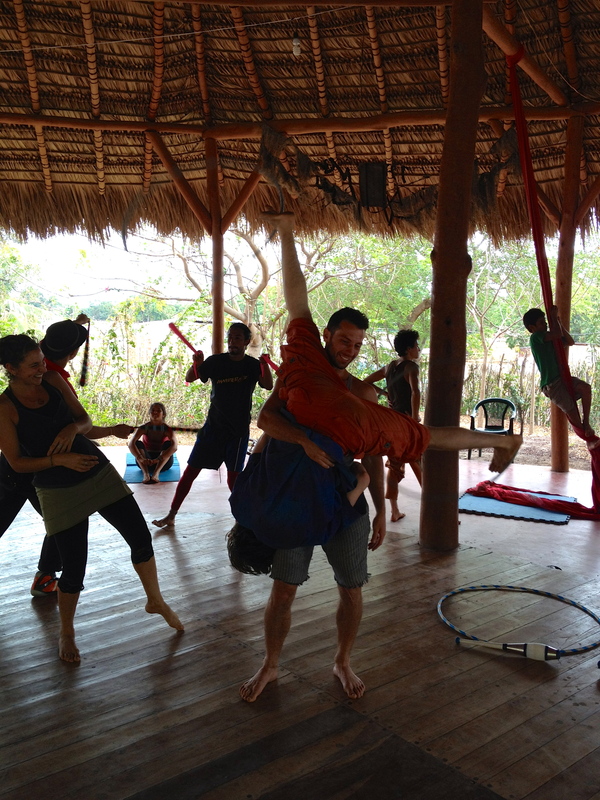 Having wanted to teach social circus in central america for a very long time,ever since i was first interested in circus in fact, I am over the moon to be in Nicaragua with PWB, my favorite charity, doing exactly that! After leading the project last year in India I was ready for a new challenge and this particular one i had been looking forward to for some time. So what is it like….? Well, apart from being hot and dusty, it is nothing like India! The national cuisine is rice and beans, accompanied by a choice of chicken, pork, beef, eggs, plantain, fried cheese and tortillas and a spicy salsa or two. The national language is spanish, although with a different accent and some unique words that are very different to european spanish. And teaching circus? Well, some things are the same the world over, although teaching in spanish is proving to be a bit of a challenge. English is not taught as much here as it is in India, so we are teaching in basic – but ever improving – spanish and mime – perfect for circus and theatre skills! On a personal note i am finding it is great to be able to speak more than just a few words of the national language (unlike India where fluent hindi is quite the challenge) and I have had great fun being able to talk more freely with cafe owners, market traders and people on the bus, and it has made me very happy to have been understood first time when asking for old inner tubes to make staff grips with, or tube and tape for hula hoops…I still got curious looks, but i could explain what i was up to at least! Circus is well known in latin amercia and has a strong tradition, although it has experienced the same decline that circus in the uk and europe did. Hence, the general population has a good understanding of circus and what it involves but people are still very surprised and amused to see someone – especially a foreigner – unicycling down the street, or carrying hula hoops around. We arrived here in Leon a couple of weeks ago, and performed for the children of El Barrilete, with whom we’re working with this month. The children from this organisation range in age from 4 to 18 and have varied and often difficult backgrounds. Most are involved with the charity for extra curricular help and general welfare support. 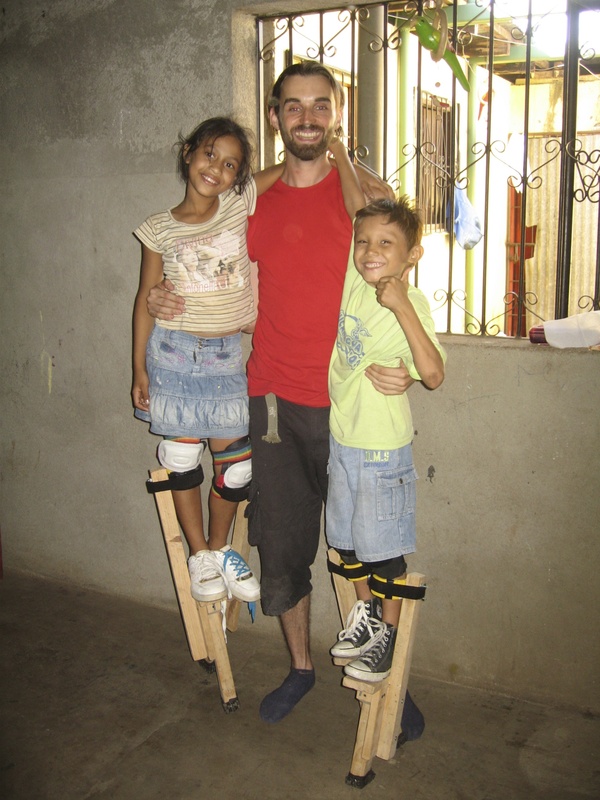 A couple of the children can already juggle a little and even own a unicycle, down to the ingenuity and enthusiasm of one student in particular. We spent the first week introducing the variety of skills we will be teaching over the month, and were soon reminded of those things that are the same the world over – children’s love of diabolo and hula hoop for example, the 5 year old’s love of collecting juggling balls into a pile and the teenagers seemingly casual indifference to most things, especially when you are watching them! As time’s went on the children have got more and more involved in the games and warm ups and we’ve begun to notice the different characters and friendships. Every day the team are greeted more warmly by the students, names are starting to stick in heads, and games are played with increasing enthusiasm and understanding. Our journey to school has gotten smoother, after trying to work out where the various buses and camionetas (covered pick up trucks with seats in the back) pick up from (anywhere, no-one agrees on one place but now we have a favorite corner to wait on) and wondering at the routes they take (never in straight lines, normally the long way round plus the centre of leon is ALL one way streets), we have some understanding of the way travel works here. The looks we get as 8 foreigners try to cram themselves, a unicycle, a bunch of hoops and a bundle of staffs into the back of an already ‘full’ (a relative concept here as in India) camioneta – whilst some of us try to remember a new spanish phrase to teach with or look up a new word in the dictionary – are amused and curious, what a sight we must be! As we prepare to start into our 3rd week here, I am excited to see how the children progress, they have already learnt so much and favorite skills are clearly emerging. My spanish continues to improve, aided by the more outgoing students who correct pronunciation and help with new words, and we all are starting to remember names and faces. The camioneta drivers wave to us, and the staff of our local ‘comedors’ (cheap eateries serving local cuisine) welcome us with smiles. The local market is fantastic and a few of us have favorite stalls we visit for fruit and veg, slowly learning the names of the things we want to buy. We have also made contact with a couple of other local organisations and performed two shows, one in a outreach project similar to El Barrillete, and one in a school for differently abled students, both received with much laughter, smiles and applause…so i can’t wait to see what else we get up to whilst we’re here! Blog 3 Kolkata Tour India 2013. On 25th of January the India 2013 PWB team landed in Kolkata- after an almost alien Indian train experience. We took the ‘Doon ‘ express, a train with 3 tier air conditioned carriages as the lowest class tickets available, 4 stops and only 32 hours to travel the width of India! I didn’t even have enough time to do my many tasks lined up for the epic journey. Our journey began with free food from the trainline, which began as a blessing, but to be woken consistently every 4 hours for exactly the same food every time was tiresome yet appreciated. We managed to play some games- pull up competitions on the top tier beds, mimicking and guessing games with minimal strange looks for the amount of noise we were making. It’s times like this when you realise you’re travelling with the circus! We arrived to the onslaught of chaos present in Kolkata culture- Howrah station at 7pm in the evening- we headed straight for our new home for the month; hotel Maria. A fantastic hostel filled with musicians and other travellers and we realised our love of noise and activity would be shared- plenty of space for early morning stretching or lazy lie-ins after a session of late night juggling on the roof! Hotel Maria is situated in the middle of Sudder Street, a road lined with hotels, hostels, tourists from all over the world and many places to eat and plan the next part of your journey. In the mornings we are greeted with Smiles from Sunny at my favourite breakfast place ‘Curd Corner’- the porridge is as good as the Grins! Along with the other daily hussle and bussle- Newspaper man with his cute puppydog eyes that makes you want to buy 10 papers from him everyday, the local man selling his bamboo flutes and violins- only knowing 2 different songs one of which is ‘my heart will go on’ from titanic- which is not the best thing to have stuck in your head all day! Random one-off fireworks light up the sky, with Wedding processions passing the hostel and dogs and cars making noise throughout the night- I’m lucky to be living on the roof where a bit of distance from street level allows a peaceful night sleep and ready to work in the mornings. 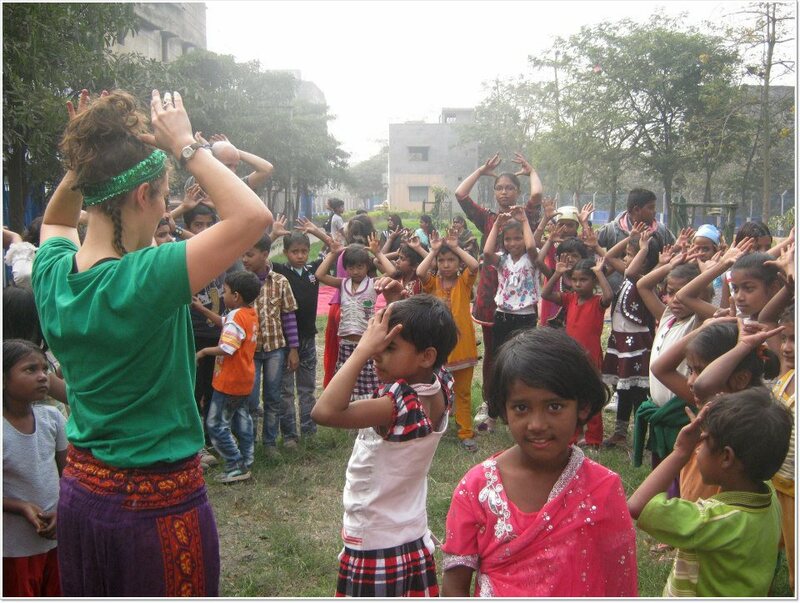 Kolkata, “Sin City”Akhtor named it, Akhtor is our contact with the first NGO that we work with ‘Los Ninos de Topsia’. As we move around the city I do get a sense of the wheeler dealer feel to the place with old men playing cards in the street and seeming like everybody is trying to sell you something…but this is also followed by many surprises turning down quiet little lanes with beautiful buildings, structures and small parks. Starting our project with Los Ninos was a real eye opener for us all on the tour, noisy and very excited children in a small confined space. The journey getting there was always an adventure… ”The Tuc-Tuc Challenge” On the first day Akhtor accompanied us…10 in one Tuc-Tuc, hanging off the sides and sitting on laps, silly but fun! With Akhtor’s help we soon figured out the Taxi/Tuc-Tuc system, which from the outside looks crazy but of course has a system, which included roads changing direction half way through the day, which tested my brain power a little. These buildings are mostly illegal structures with many converted into shops or factories on the ground floors. It is here that we dutifully follow Akhtor along lanes and rubble to a block of flats with a narrow dark staircase up to the rooftop where we find Los Ninos. The NGO provides a space for lessons, homework and creative play, the idea being to help supply a basic education to reach a school level and then to support the child whilst at school. The children here have very little but make up for it in buckets of attention and love. It really was a pleasure to work with these children who are surrounded by waste, recycling and toxic smells. We just visited for one week and shall leave again, this is their reality. “The poorest district in Topsia is an elongated island between two canals of waste water, about a kilometre in length. There are two parallel rows of huts each overlooking a polluted waterway, the smell of which is so overpowering you can taste it.” (Seabrook and Siddiqui) Here is where we walk the children back to, at the end of the workshops, back to the slum hand in hand, not only for comfort but also, safety in numbers. Kika, an amazing lady from Spain, who began the NGO explains that they have had problems with child kidnappings for the organ donor market. In the past month 7 children have gone missing, shocking. All these thoughts are racing through my brain as we sing “Twinkle, twinkle little star” on the way back to their homes. All the more amazing on show day! The children were dressed in their bestclothes and really made a great show for themselves, their families and the whole community of Topsia. Performance with Yo-Yo, Plate Spinning, Ribbon Dancing, Juggling, Flower Sticks, Acro and a group Song, all this in less than a week with the children. I believe Topsia and our time there will be ingrained in our memories for life. A longer project here would be amazing but the issue is space, Kika has already had to move several times to accommodate the amount of children. Growing amounts of people is something we are all getting used to here in the Megatropolis, a population of over 14.7 million and counting. Anke reminds us the population of this city is larger than the entire population of Holland. The street is where all life seems to happen, living on top of each other, washing, cleaning clothes, plates, eating, drinking, sleeping and toileting, a real experience to witness. One of the charity’s projects is working in conjunction with Kolkata Police, setting up and running Nabadishas. This is the name given to the project, providing a safe space for street kids to go to and receive a basic education, with both formaland non-formal education. The centre has a real youth club atmosphere; the teachers are very friendly, helpful and work tirelessly throughout the day. A well run inspirational team. We have two sessions one in the morning with the 2-10 year olds and another in the afternoon evening session with 8-16 year olds, all are very polite and interact well with each other and us, and really appreciate given a chance to play and perform to each other. A show off at the end of each workshop has been a great platform for these children to shine and show us not only what we have taught them but other skills such as dance routines, Hip-Hop moves and a super fast hand clapping game which we all attempt to play along to. Again we are only with the Nabadisha briefly for a week but progress has been very fast and all have enjoyed the sessions. They have had many interactions with foreign volunteers…but never a circus before! Tomorrow is show day and we are all excited to see what will be created. For us we shall perform select parts of the show due to dwindling light and health of some team members. Time for a well earned weekend off, where we shall have a chance to take stock of all we have seen, smelt and shared so far. An explosion for the senses, for those that have never been to India before it has been a fast learning experience. I find I often fall asleep with flashes of all the faces, colours, sights and sounds I have been exposed to throughout the day, many smiles have been shared, but it is only the beginning! It seems to me that one of the main aims of any charity should be to make itself obsolete. By that I mean that if the ‘thing’ that the charity provides is in some way already covered at the point of contact, then in theory the charity no longer needs to go there and work. Right? Well, maybe. 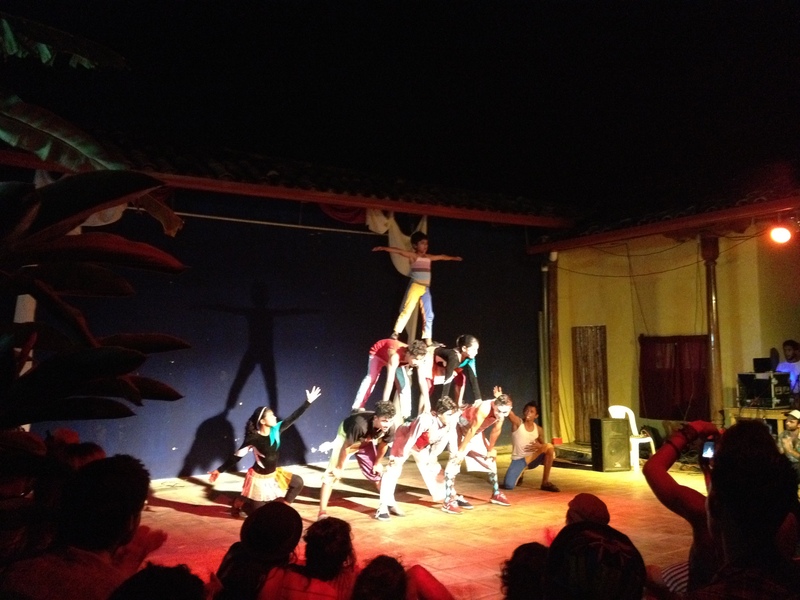 One of the most fascinating things about this Performers Without Borders project in Nicaragua is our contact with La Escuela de Comedia y el Mimo in Granada. 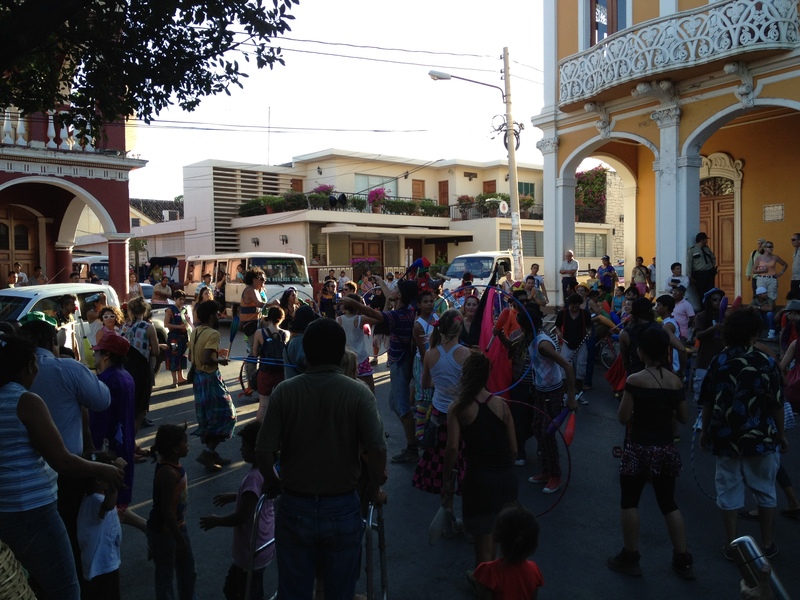 The school runs social circus, theatre, clowning and mime work in the local communities, and each year hosts a festival called ‘El Berrinche Ambiental’, which is dedicated to all of these subjects as well as having a large environmental twist. So if there is a local organisation already doing what PWB does, why are we coming here? First of all, it’s not as simple as it might sound. 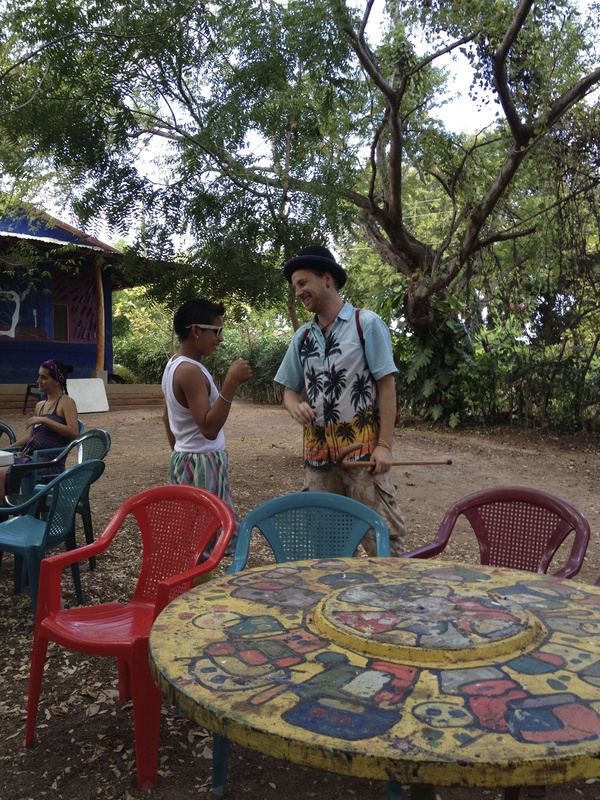 The school was set up around 10 years ago by Diego Gené – a clown from Venezuela – and was initially a social theatre project working with gang members from local barrios. 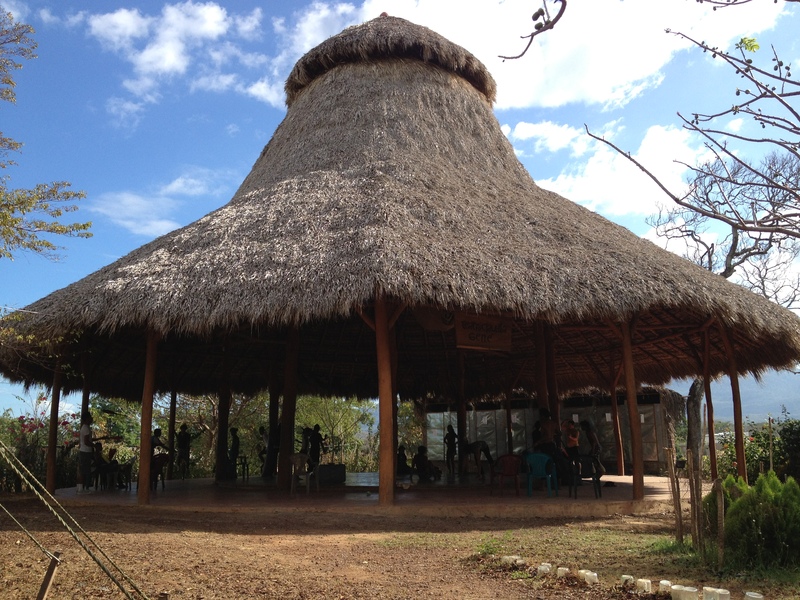 The project grew, and a few years later they were able to buy some land and build an amazing place called La Casa de las Botellas – literally a house made of plastic bottles; as well as a theatre space and training room. Each day they feed and assist around 60 children with schoolwork, as well as housing several of the project members and providing a venue for the festival. Although the core members are incredibly talented, they are still very young and relatively inexperienced in the world of theatre and circus. Rafa Largaespada, one of the original students, is now the Director of La Escuela at only 25, and most of the group are in their teens or early 20s. 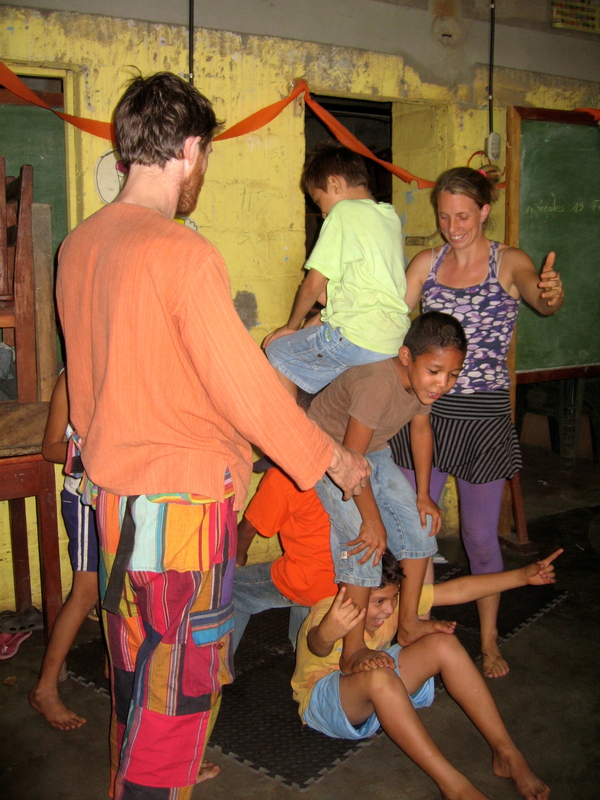 They have incredible energy, huge grins, great skills, and a real drive to make La Escuela into a self-sustaining project that can do outreach and performance work further afield. In the past year they have taken over a city-centre café with a performance space and want to buy it outright, build a hostel and thus ensure a steady income to support the school. So… PWB have come to visit with a few goals for our two trips to Granada – one just past and a second at the end of our tour. We want to support the festival and help it raise money to further their project. 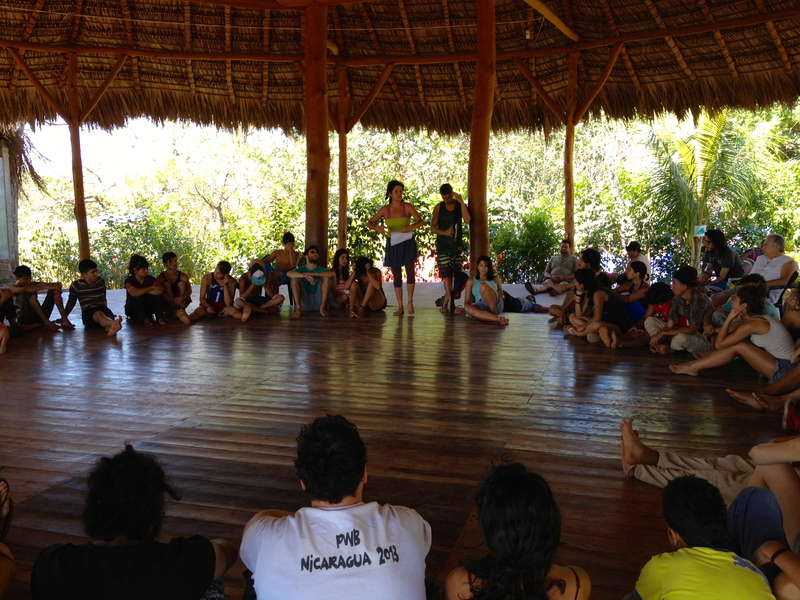 We want to help develop the skills of the Escuela core team in performance, teaching, safety and administration so that they can improve what they have to offer and become the organisation they want to be. We want to work with their kids directly and share our skills with our dubious Spanish. We also want to experience and assist in the creation of a festival that brings people together from all over Latin America, creating contacts for future PWB teams and individuals across an incredibly vibrant continent. The festival itself was an amazing and slightly nerve-wracking experience for a team fresh out of boot-camp. Amazing as we were meeting artists from many different countries, getting to watch great shows, teaching local and street children circus, learning huge amounts about the culture and way of life here… and nerve-wracking mainly for 2 reasons – firstly we were all pretty unsure of our language skills, and secondly we were treated as famous international circus guests with a fantastic professional show! Little did they know that we had met as a group for the first time only 8 days previously. Fortunately the Spanish held up well and improved quickly with constant conversation, but the pre-show nerves only increased as we watched a number of brilliant groups present their creations, including my highlights Circo Fantazztico from Costa Rica and the Venezuelan National Circus Company. When our turn finally came around, we had to deal with our incredibly British punctuality clashing with ‘Nica-time’ – a great lesson in patience as our bus didn’t pick us up until 5 minutes before we were due to go on! Sure enough everything was fine – we turned up, hung around a little, finally went on nearly 90 minutes late, and had a great show. As it was the first run it was a little ropey in places, but we enjoyed ourselves, as did the crowd and festival-goers. We followed it up with two shorter cabaret style shows, both of which went down very well indeed, with Jake and Moira starring on slackrope and accordion and generally being the life and soul of the festival. 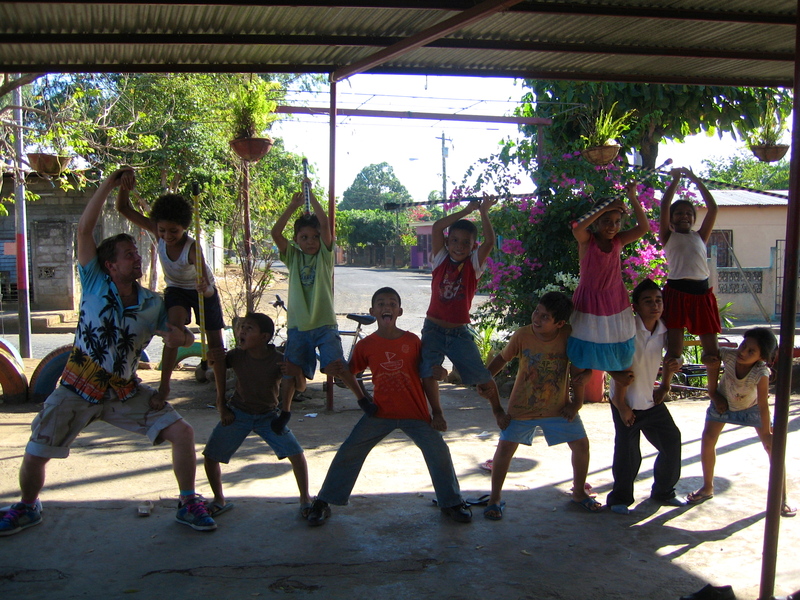 Each day we spent a few hours in the morning working with kids from the local area who came to the Casa de las Botellas to learn circus. The aim of this was to involve them in a huge performance of all the festival and community on the Saturday. In the end only a few of the kids were able to take part, but those that did had a great time on stage, and the community show was very well received. We struggled a little with the timetabling, again being so used to strict schedules meant we were uncertain what to do when the rest of the world seemed to ignore the plan! But somehow each day seemed to get to the end without major disasters and we slowly loosened up… and as we’re finding everywhere we have been so far, the kids learned very quickly – we can’t wait to get back in April for some more focused time with them. So was it worth PWB coming to El Berrinche Ambiental? Yes, of course! We learned loads, taught loads, helped raise money for them, made great friends and contacts amongst the arts and social circus scenes, met up with many voluntary workers and organisations, shared our skills in person and on stage, made heaps of people smile, and had a great time. It was great to work with the team from La Escuela de Comedia y Mimo, and we hope it is the start of a long and fruitful partnership between them and PWB. The time has sped by with all our energy and time immersed into the creative process with little spare to soak in the idyllic paradise surroundings of Kudle Beach, Gokarna. All day we have been in the Yoga space at Namaste Farm together, learning how to work with each other and forming a team. Sunday arrives very quickly, our fantastically designed posters by Paul, advertise our show for today at 5.30 on Kudle Beach, word has spread and there is an excited atmosphere as we take breakfast in the usual cafe. The children of the owners are pointing and arranging the posters, they have remembered the previous shows and ask us if we have the police man again or the really bendy girl…It’s a surprise we tell them, they just have to wait. With bellies full we head up to the space to run through a scene that needs work and to have a full dress rehearsal. All goes well except for the music, which gets wiped from the I-pod. A re-sync is necessary; however this takes a lot longer than expected. Time is ticking and the computer is flicking and my belly is aching for some lunch, no time for nerves! The rest of the team head to the beach, our stage for the evening, with the props and costumes, at 5.00 the I-pod is ready and I rush to join them. Hey we have a show to do! It seems a bit disjointed at first, as a crowd forms and we attempt to set up the stage in the sand, I haven’t even got changed yet but the music is playing and the people are coming, and the questions start flying…Where will the fire props go? Who’s seen my YoYo? What’s the order of the fire show again? Did I bring my waistcoat down? Haha, as I say no time for nerves. I change and prey I have overcome my technology fears and that we have a show playlist! A big crowd is forming now, children, travellers and locals, dogs, hippies and a Holy man who sits on the rock directly behind us embracing the spectacle. At least the Holy man is wearing Orange, this is our chosen colour for “School Daze PWB 2013” and we are all ready for the debut performance. 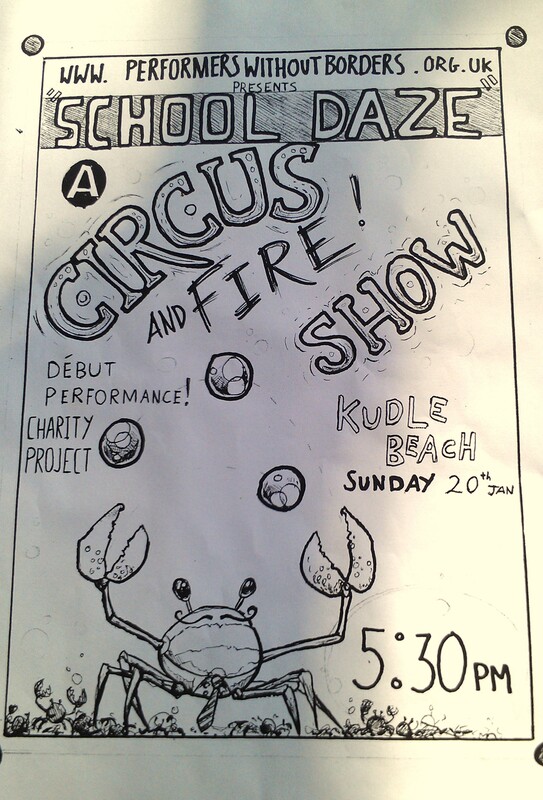 It is as the title suggests a school themed show at a fun circus filled school with lots of laughter and joy. A Jurassic 5 inspired classroom club routine and onto dinner time, which you guessed it involves spinning plates and Opera. The Sun is setting and after a nifty diabolo duo of Paul and I, the time is right for the FIRE! This part of the show has unfortunately had little time dedicated to it; the performers don’t even know which songs I have chosen for some of the routines; however the skills in the team produce a top show which will only get better as we train more together. The grand finale with Livi performing double fire hoop is outstanding but will also need a little more work to make it more GRAND. Clapping and bowing and I shout myself hoarse explaining to the crowd the nature of the project and how they can follow us on our adventure…which is just now beginning!! WOW what a reaction and what a send off to keep us smiling till Kolkata, our next stop! You are currently browsing the Performers Without Borders blog archives for February, 2013.